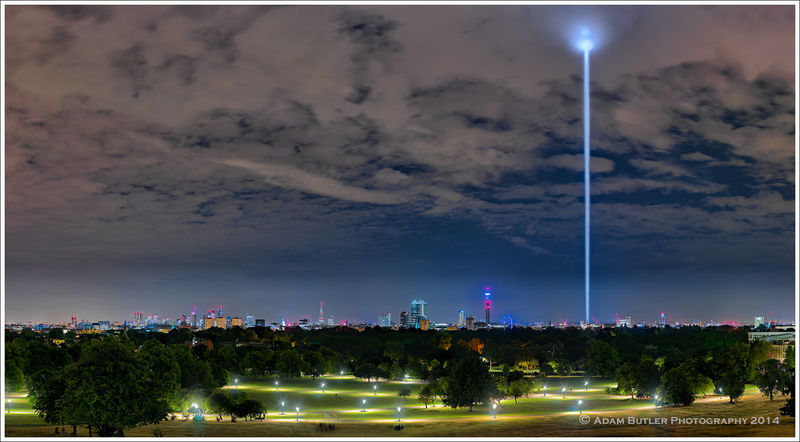 On August 14th 2014 a strong light beam commemorating the centenary of the start of the Great War was directed from the sky from a site adjacent to the Houses of Parliament, this spectacular light display was visible from all over London and beyond. 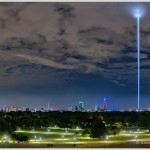 From Primrose Hill, many people gathered to see this light. Silence prevailed, as the people sitting, standing, or lying on the grass contemplated the tumultuous and tragic events of the First World War, and to remember the fallen. The evening was clear and warm, with good visibility, and in fact the scene was wonderful with the twinkling lights alongside the pathways of Primrose Hill mingling with the distant lights of the many iconic buildings of London. Almost everybody was snapping away with their camera phones, many using the flash, which of course would not illuminate anything – certainly not the night sky! I decided that, rather than just attempt to capture the rather banal view, which besides everyone was photographing, I would try to capture the atmosphere of this unique event. Their was an almost carnival feeling, with many groups of people enjoying the warm summer evening. These groups of people gazing up at the sky would be, for me, a much more interesting subject to capture. I had my Hasselblad camera and a tripod, since I knew that I’d need to utilise a long exposure to capture the night view. Of course, you cannot photograph successfully people using long exposures, but Hasselblad digital cameras like mine with CCD sensors are not suitable for high ISO shooting in low light conditions. Therefore, I knew that I would need to take a series of images and hope to get some in which some people were still, and then digitally blend together the various steady parts of each image together in post processing. Luckily, many of the groups were sitting quite still, and in awe of the view, so this proved relatively easy, despite having to utilize a 20 second exposure at f5. The only issue was that many people beside me were pointing their little iPhone cameras at the sky, and when trying to focus their lights would coming on, flooding with light the people in the foreground that I was trying to photograph with the soft ambient light. In the end, this did, however, give quite a nice effect, picking out the backs of the groups in the foreground as did the gentle movements of&nbsp; the people in the final image – creating an almost ethereal, otherworldly effect with everyone looking out to the sky and the amazing lightbeam which shot up and illuminated the clouds. All in all, I think this turned out to be an interesting shot that for me works quite well!